As you email back and forth with other Gmail users, you will slowly get accustomed to seeing the pictures others have added to their profile; by default, since Google can't know how you look like, you have a default, generic icon / picture to represent your profile. But if you have a digital photo of yourself, you can in just a few clicks upload it and use it for your profile, as you'll learn in this tutorial. Once you are inside your Gmail account, click on the Settings link at the top, and your account's options will load - the General tab, which contains your profile picture settings, is automatically selected. If you have a "Picasa Web Album" with pictures on it (Google purchased the Picasa photo sharing app a few years ago), choose this setting from the left pane. Finally, Gmail allows you to use as image for your account a graphic file that is already somewhere online: to do so, click on "Web Address (URL)", and type or paste the exact address of the photo you'd like to use. Here's the first picture we found, but won't use since it is probably copyrighted by the website owner (as a good rule of thumb, everything is automatically copyrighted unless explicitly stated otherwise). Depending on the dimensions of the image, you will get to a next step that allows you to tweak and edit the photo you picked: if it is not a perfect square, for example, you will have the opportunity to crop a square out of it, right from your web browser! Once you have saved and applied the changes, Gmail will bring you back to the Settings screen, where you'll be able to preview your profile picture, and customize its privacy options: either leave the default of "Visible to everyone", or restrict the profile picture's visibility to "Visible only to people I can chat with". Scroll down to the end of the page to see if the "Save Changes" button is enabled (not grayed out) - if so, click on it to apply the new profile photo settings; if not, everything was already saved. 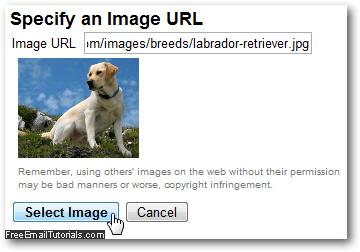 And this is how you add a picture to your Gmail account / profile!